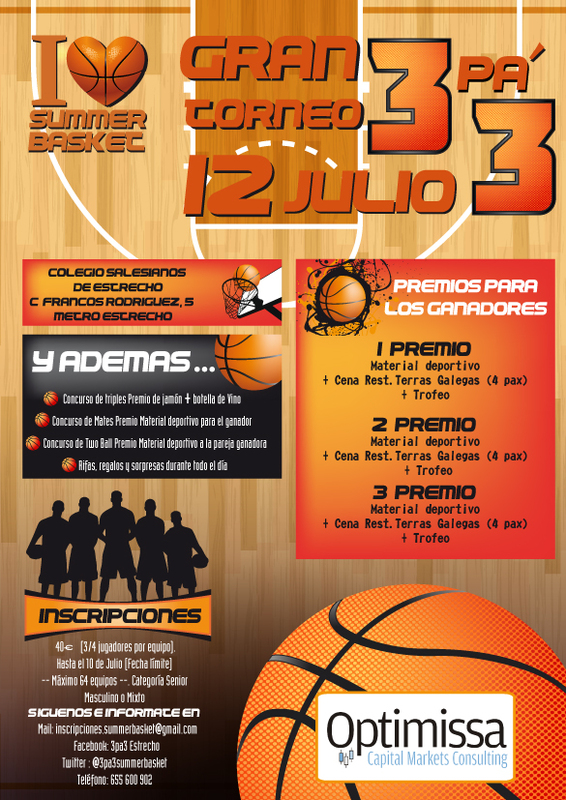 Optimissa has sponsored the first 3pá3 Summer Basketball Tournament, which took place on the 12th of July in Madrid. 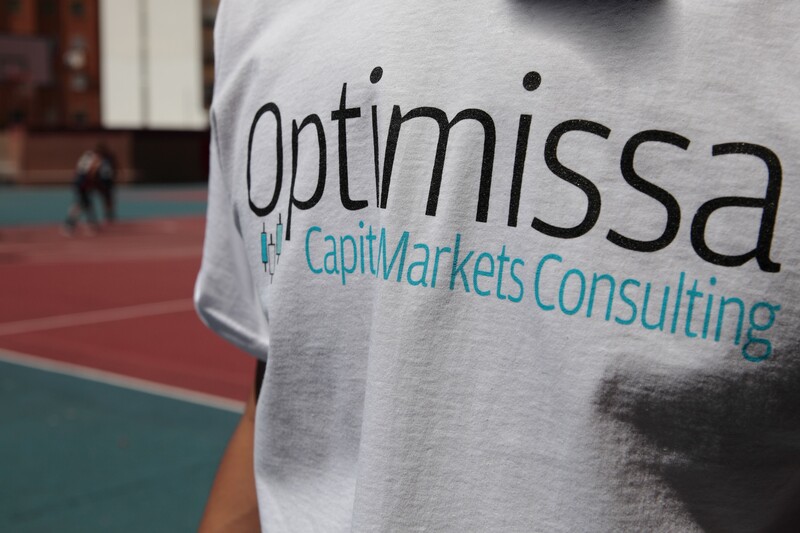 Sixteen teams participated in this event and shared the spirit of the tournament sponsored by Optimissa: “I love summer basketball”. Today we interview Edu Ramos, creator and organiser of the competition. Edu Ramos: That’s right. It was precisely the great amount of sports competitions like this that prompted my two partners in the organisation and me to ask ourselves… why not create our own event? The three of us have been playing basketball since we were only eight years old. During all this time we have met a lot of people who we were sure would welcome the idea and would help us to promote the tournament. O: What does “3pá3” mean? O: What was the most remarkable difficulty you came across during the organisation? What did you find the most rewarding? ER: It’s difficult to imagine as an outsider all the obstacles and tasks in the organization of an event like this. If we were to compare it to the consultancy world, it’s similar to managing a project. In the first place, it’s necessary to plan all the tasks to be carried out, from the budget and expense forecast to marketing and communications activities. A complex coordination of the teams is also required, both during during the registration period and during the day of the competition itself. Without a doubt, the most rewarding thing has been the end result. There was a great basketball atmosphere and we have been able to see for ourselves that people were very pleased with the event. O: How was O ptimissa’s sponsorship like? ER: Knowing about how much Optimissa supports sport, my partners and I thought about presenting our project to them and requesting their collaboration. From the very first moment, Optimissa has been fully committed to the event, providing the necessary equipment for the teams and prizes for the winners. Optimissa’s sponsorship has been key to make our “3pá3” viable. O: Can you describe the atmosphere of the event? How many players participated? ER: As I mentioned before, you could really feel the basketball atmosphere, an environment of people in love with this sport and who displayed very good sportsmanship. As part of the event management, I’d like to take this chance to express my gratitude to all the participants. The tournament included 16 teams of four players, which made a total of 64 players. Every team played a first round in a mini-league format of three matches. The eight qualified teams then competed in play-offs to establish the ranking. O: It sounds like the first 3pá3 Summer Basketball Tournament has been a huge success. Will there be a second one next summer? ER: It’s still early days to be able to confirm it with certainty, but no doubt we’ll do our best to make it happen, and even to increase the number of teams involved.